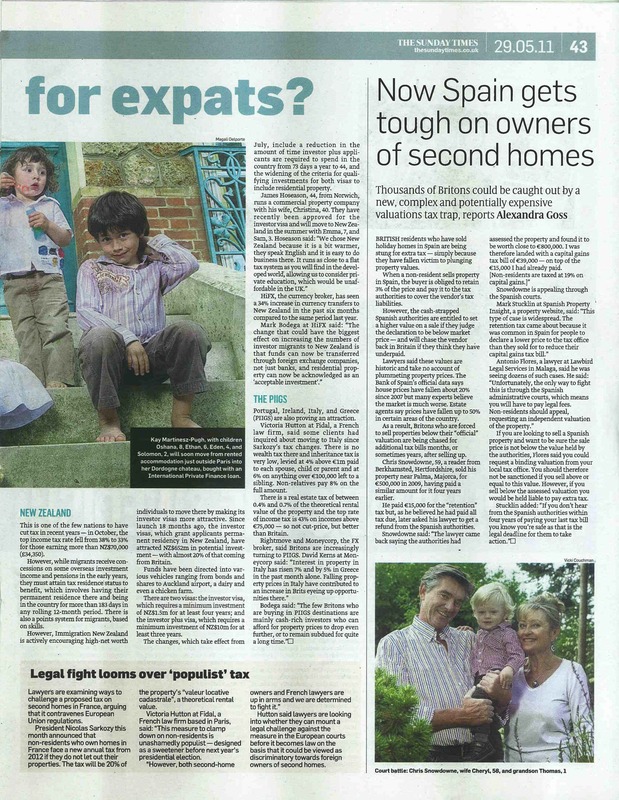 BRITISH residents who have sold holiday homes in Spain are being stung for extra tax — simply because they have fallen victim to plunging property values. When a non-resident sells property in Spain, the buyer is obliged to retain 3% of the price and pay it to the tax authorities to cover the vendor’s tax liabilities. However, the cash-strapped Spanish authorities are entitled to set a higher value on a sale if they judge the declaration to be below market price — and will chase the vendor back in Britain if they think they have underpaid. Lawyers said these values are historic and take no account of plummeting property prices. The Bank of Spain’s official data says house prices have fallen about 20% since 2007 but many experts believe the market is much worse. Estate agents say prices have fallen up to 50% in certain areas of the country. As a result, Britons who are forced to sell properties below their “official” valuation are being chased for additional tax bills months, or sometimes years, after selling up. Chris Snowdowne, 59, a reader from Berkhamsted, Hertfordshire, sold his property near Palma, Majorca, for €500,000 in 2009, having paid a similar amount for it four years earlier. He paid €15,000 for the “retention” tax but, as he believed he had paid all tax due, later asked his lawyer to get a refund from the Spanish authorities. Snowdowne said: “The lawyer came back saying the authorities had assessed the property and found it to be worth close to €800,000. I was therefore landed with a capital gains tax bill of €39,000 — on top of the €15,000 I had already paid. [Non-residents are taxed at 19% on capital gains. ]” Snowdowne is appealing through the Spanish courts. Antonio Flores, a lawyer at Lawbird Legal Services in Malaga, said he was seeing dozens of such cases. He said: “Unfortunately, the only way to fight this is through the Spanish administrative courts, which means you will have to pay legal fees. If you are looking to sell a Spanish property and want to be sure the sale price is not below the value held by the authorities, Flores said you could request a binding valuation from your local tax office. You should therefore not be sanctioned if you sell above or equal to this value. However, if you sell below the assessed valuation you would be held liable to pay extra tax. This entry was posted in In the Media and tagged Antonio Flores, Lawbird on May 29, 2011 by admin.